The dining menus application has received a major overhaul. Menu navigation has been streamlined and is now more intutive. To check out the new dining menus application here: http://go.middlebury.edu/menus. We are going to offer an alternative to the “Juice Bar” feature that’s used on some sites, like Economics, Studio Art, and International Studies. The new feature will work like the image gallery on the Museum of Art site and will only require editors to produce images for the feature, instead of messing around with the “Juice Bar’s” clunky editing form. Here is a mockup of how this might look on the Economics site. When downloading a report to Excel, you can now choose to only download the last N number of submissions, or submissions from a particular date range, or only the new submissions that have come in since the last time you downloaded a report to Excel. You can now make a form field “private”. This will hide the field on the form and only people who have access to edit the form will be able to fill it out. This is useful for “department use only” fields. We now check both the file extension and MIME type of file uploads, which should resolve issues with Firefox users being unable to upload files due to having a corrupt mimeTypes.rdf file. A QR code is now accessible for each GO shortcut via the info page for each shortcut. Just click the (i) icon next to any shortcut in the Gotionary and click the “Display QR code” link. 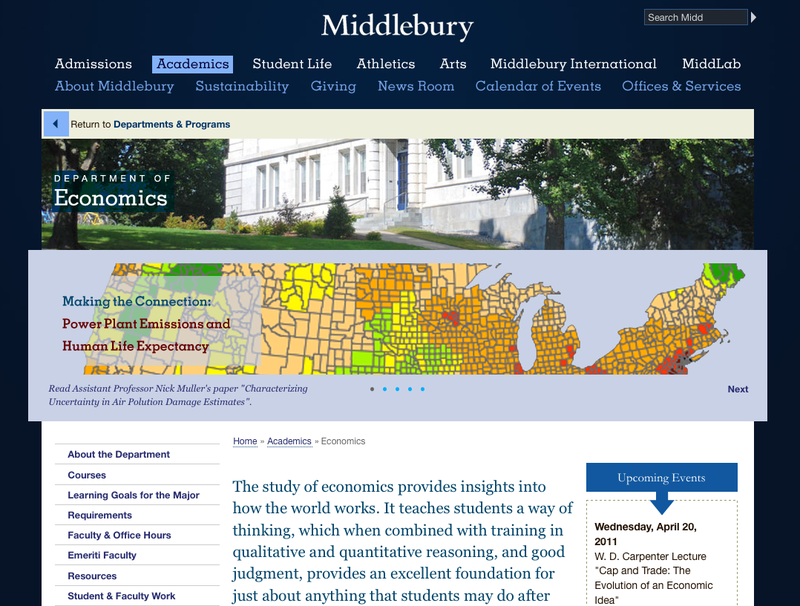 Four posts this week contain interviews with Middlebury Faculty, Staff, and Students. This entry was posted in LIS Staff Interest on September 9, 2011 by Ian McBride.